All over the United States, American Indian communities are working to protect the natural world and educate others about environmental issues. 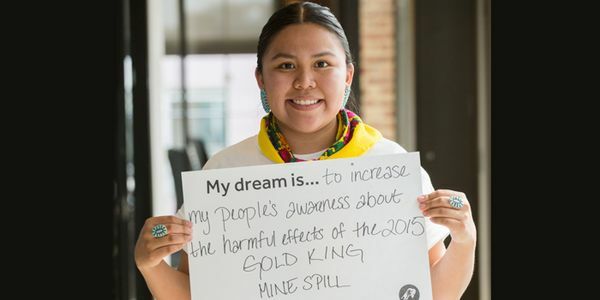 18-year-old Sunny Nez (Diné) dreams of exposing the high levels of contamination of the Animas and San Juan rivers by heavy metals and toxins in the Animas and San Juan rivers and to educate youth in her community about the importance of preserving natural water resource. These rivers – sources of life and livelihood for many families – were impacted by the 2015 Gold King Mine Spill, which released 3 million gallons of toxic mining waste. Sunny's program will involve collecting water, riverbed, and onion bulb samples 3 years after the disaster to measure levels of toxicity in the water. "In Navajo, we say water is life. Water is the foundation of everything, it represents the south, and a long time ago our deities left this world for us to take care of it because we were taught everything we are supposed to know by them. I want to demonstrate to my peers, colleagues, and younger people that we still need to be our own Water Protectors because we are children of Mother Earth." As one of Running Strong's "Dreamstarters," Sunny is in a group of ten remarkable young people with dreams of improving their communities. Together, by supporting Sunny and her project, we can help make her dreams come true. Sign the pledge and support Sunny's dream of protecting water resources and ensuring our waters are safe for future generations.